Top Lawn seeks to be a company that provides a quality product and personal service at a competitive rate. We wish to be perceived among consumers as a company that is reliable, accountable, and personable. We operate in accordance with all rules, regulations, and requirements of our industry and our corporate status. We endeavor to establish and maintain a company name that is synonymous with quality service, expertise, and professionalism both with consumers and with peers in our industry. We believe that by providing quality service, quick response to any request, and a professional appearance in everything we do, we will create and foster trusting relationships with consumers, management companies, and independent contractors in our industry. We believe that this trust will lead to long-term customer retention and quality word-of-mouth referrals. Top Lawn is an owner-operated family business. Owners Mike Curlee and Ken West both own homes here locally and have families just like you. Ken and Mike have been working in this industry for over 30 years combined and guarantee there isn’t a lawn problem they can’t fix. They know you expect professional service and top quality results from your lawn service company. At Top Lawn WE NEED YOUR BUSINESS and will provide the extra care and service to get it and keep it! Let our professional 7 step lawn program provide you the very best in Michigan lawn care this season. 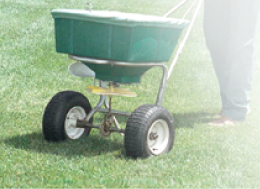 Our treatments are strategically timed throughout the season for effectiveness to help your lawn flourish. Shrubs and trees can increase property values as much as 20 percent, yet they are some of the most overlooked aspects of landscape service and care. Our 6 step tree program is safe and effective to help you retain the health and value of your trees. Call us today for all your Michigan tree service needs. From deer repellent to perimeter control, Top Lawn offers the very best in Michigan pest control solutions. Protect your pets and family from harmful ticks and fleas while also keeping your landscape beds free of infestation. Call 1-800-TOP-LAWN (867-5296) today for all your pest control Detroit Metro needs.